FACT CHECK: Have US Airstrikes In Somalia Tripled Since 2016? Warren Bass, a senior editor at the Wall Street Journal, claimed that U.S. airstrikes in Somalia against the militant group al-Shabab have tripled since 2016. “As Trump tries to leave Syria & Afghanistan, he has authorized an often overlooked escalation in Somalia—doubling the size of the U.S. force there and tripling the number of U.S. airstrikes against al-Shabaab since 2016,” he tweeted Jan. 17. 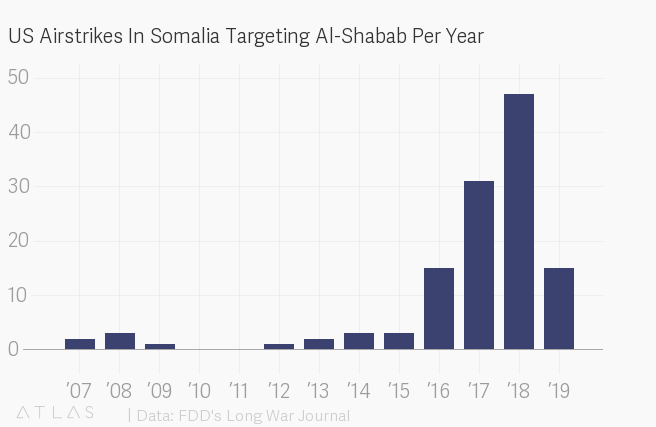 In 2018, the U.S conducted roughly 47 airstrikes against al-Shabab insurgents in Somalia, more than three times the number carried out in 2016. Al-Shabab, an Islamic extremist group with ties to al-Qaeda, has been waging war on the Somali government for more than a decade. The insurgents are responsible for deadly attacks in Somalia, but also neighboring Kenya, where 21 people were killed recently after militants attacked a luxury hotel complex in Nairobi. For years, the U.S. has carried out training missions, ground operations, and since at least 2007, airstrikes in Somalia. “Airstrikes reduce al-Shabaab’s ability to plot future attacks, disrupt its leadership networks, and degrade its freedom of maneuver within the region,” reads a November statement from U.S. Africa Command. Strikes may be carried out via aerial drone or manned aircraft like the AC-130 gunship. The U.S. conducted 15 airstrikes in Somalia targeting al-Shabab in 2016, a Department of Defense (DoD) spokesperson told The Daily Caller News Foundation. In 2018, the U.S. conducted 47 airstrikes – a more than threefold increase. At least three groups – the Foundation for Defense of Democracies (FDD), the Bureau of Investigative Journalism and New America – track U.S. airstrikes in Somalia, and while there are slight differences between the figures reported by each, they are all largely consistent with DoD figures. The increase coincides with a concerted effort by the Trump administration to intensify U.S. operations in the country. Soon after he took office, President Donald Trump took steps to ease combat rules in Somalia, declaring parts of the country an “area of active hostilities.” The move allowed airstrikes to be carried out with fewer hurdles, but also increased the risk of civilian casualties. The same year, the number of U.S. military forces in Somalia more than doubled, according to Politico. The Pentagon currently has about 500 personnel in the country, a DoD spokesperson told TheDCNF. The U.S. recently announced that it would no longer publish details on the number of fighters killed by these airstrikes, with a U.S. Africa Command spokesperson telling The Associated Press that it will be up to the Somali government whether to share this information or not. Some experts are skeptical of what a limited bombing campaign in Somalia can accomplish. Despite the escalation of the last two years, NBC News, citing two senior U.S. officials, reported in January that the Trump administration is considering plans to scale back airstrikes in Somalia. The U.S. has carried out 15 airstrikes in Somalia so far in 2019, according to the Long War Journal.